Our June newsletter is currently being printed. But you can view the web version here. It’s jam packed full of pictures, articles and hopefully will be a nice read sometime over winter. 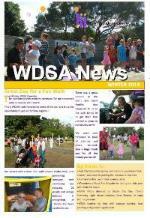 WDSA AGM and Consider Joining the Committee? Just reminding you that our AGM meeting on Thursday 20th June. Katrina Sneath is a very confident young woman with Down syndrome. She is currently sitting NCEA and is passionate about self-advocacy. She will be sharing some of her life story. Her parents have been very focused on reading and using the Down syndrome education resources and will also be available for questions. Ross Wood is a student at Victoria University. We always need new people and new fresh ideas. Our secretary is standing down this year. But there are a number of opportunities to help and improve WDSA. Please consider if you could get involved and help. Need some encouragement? Check out this amazing story of Karen, who has swam across the English channel, runs her own foundation, hold a Science degree, teachers aid cert and honorary doctorate.